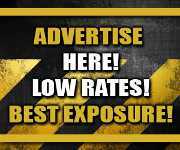 Post subject: FRN website, forum, & directory! The FRN directive is about providing a means of educating the public and networking with others in the industry. Not everyone has to agree with everyone that would be ridiculous to request or expect. • An open network for professionals in the field to communicate with each other. • A means to provide information to those already established, new people, or those wishing to enter in the industry. • We welcome participation from everyone. Bail Bondsman (persons? ), Bail Apprehension/Fugitive Recovery Agents, Private Investigators, and the general public. • Everyone should feel welcome to participate and/or read; No one is excluded from the Public Areas. We would ask that you as a member agree and understand these directives. 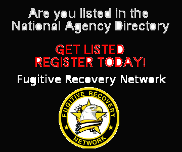 Please pass this on - as well as - invite others from the industry to join you in the Fugitive Recovery Network! Last bumped by Phill Cross on Tue 10 Jan 2012 11:18.